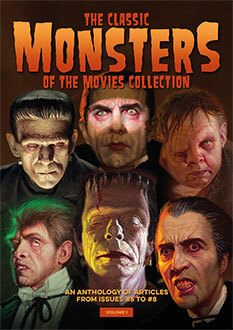 The science-fiction horror thriller, Frankenstein 1970, was released by Allied Artists on the 20th of July, 1958. 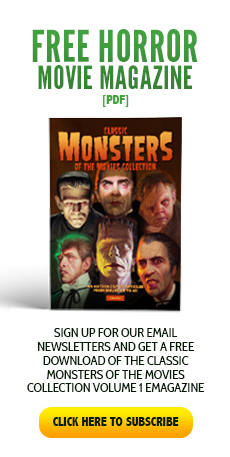 Starring Boris Karloff as Baron Victor von Frankenstein, the film deals with that scientist’s horrible disfigurement suffered at the hands of World War II Nazis. Using the power of television to secure funding for his experiments, Frankenstein harvests the required body parts from his SS tormentors. Naturally, desperate ambition gets the better of him, and he turns on his faithful butler for the last few difficult-to-get parts. The Monster turns on the baron and, in good old horror film fashion, both are killed, this time by a blast of radioactive steam. 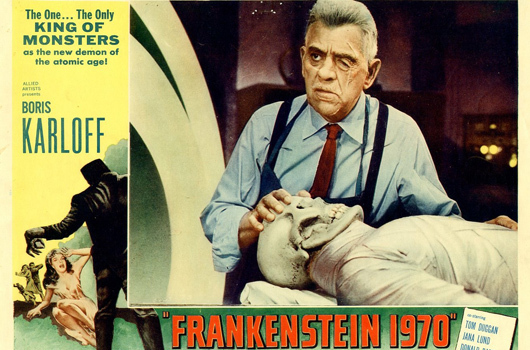 Frankenstein 1970 was shot in black and white and CinemaScope, and completed in a mere eight days on a shoestring budget. The “1970” was added to the title to lend the obligatory futuristic touch required for 1950s sci-fi films.